Crafters!!!! 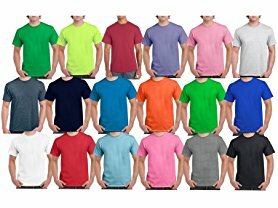 Right now you can get Gildan Men's Short Sleeve Tees 12 Pack for $26.99 (Retail $72). That's $2.25 per shirt. Colors are random. You will receive minimum 8 colors total. Minimum 2 Black, 2 Sport Grey and 6 other colors.